Globe/T. 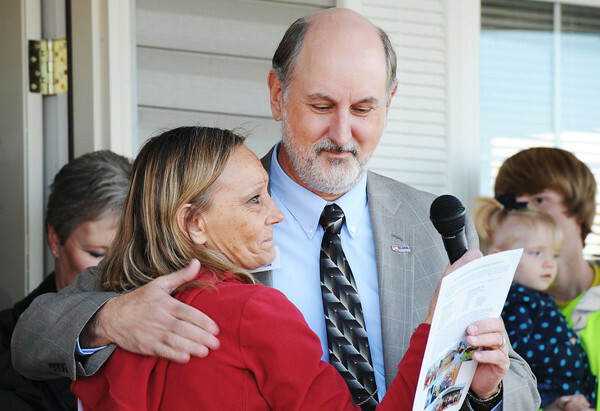 Rob Brown Richard Crow with Joplin Area Habitat for Humanity, gets a hug from Linda Hazley, one of five families which will soon be moving into homes built through the Governor's Joplin Challenge in cooperation with Habitat and the Kansas City Chiefs in front of Norma Taylor's home Tuesday afternoon, Nov. 13, 2013, in the 2600 block of Kentucky Avenue. The five families include: Taylor, Wayne and Jamie Crandell, Amy Stockton, Hazley and Laurence and Marchella Claar.